The famous Arthur Guinness signature is featured in red print on this Irish t-shirt. The colorful Guinness toucan, with a pint on his bill, is featured in full flight on this Guinness t-shirt from The Irish Gift House. 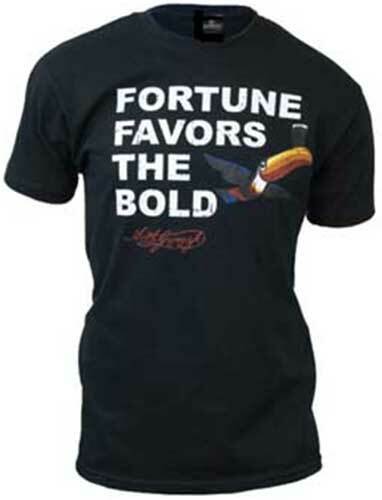 The Irish t-shirt is further enhanced with the famous Arthur Guinness signature and a statement that says Fortune Favors the Bold. This black Guinness t-shirt is 100% preshrunk cotton, but it is available in limited sizes.